An odd subject for a web page you may think but if you are planning on visiting the town it’s a very important matter! 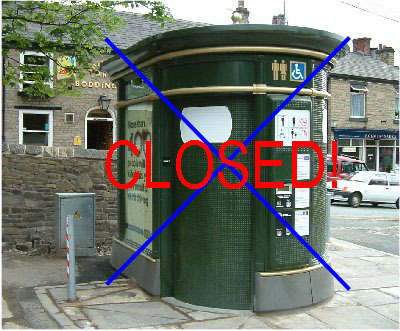 Bollington has not been well endowed where the essential facilities are concerned and there has been much criticism of the Town Council and Cheshire East Council for not improving matters. With a distance of over two miles from end to end there is probably a case for two or even three. Macclesfield Borough Council installed a PSL ‘Superloo’ at Pool Bank, opposite the Spinners Arms pub – available 24 hours a day at a cost of 10p a go! The advantage of this was that it was less likely to be subjected to vandalism, was accessible to the disabled and was automatically cleaned after every use. However, this was a very expensive facility for the public purse. Cheshire East Council, who took over the contract, paid out thousands of pounds a year in rental and servicing charges. In these days of austerity it was very clear that this facility was poor value for money and once the contract was time expired the loo had to go. It was removed in April 2015. All pubs and restaurants, and Waterside Café, have toilet facilities available for customers during opening hours. In the early 1970s there were a number of additional facilities, but only for gentlemen! One was on Palmerston Street by the entrance to the Recreation Ground – a couple of angled walls for modesty, a trough and a drain pipe that emptied straight into the river Dean! Until more recently there was also a similar facility on the Recreation Ground. Alas, that fell to the ravages of vandals.